← Delhi was more than I expected to be honest. The vibrancy and “controlled” chaos is unlike anything I’ve seen elsewhere. I will tell anyone who asks: Rome is to me what the sun is to Superman. It is my home, my love, and my return. If you must, take a map but “flying blind” really is part of the fun of Rome: getting lost, finding little cafés, little shops, or just watching people go about their business. 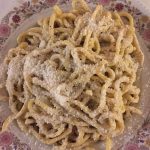 There is so much that I can tell you and suggest for you, but below are my highlights and where I go every time I return to Rome. I hope that you enjoy it as much as I do. The number of hotels opening in Roma are truly fascinating. There are some old standbys that I still love, and some new players that have joined the scene. The Hotel Ponte Sisto (http://www.hotelpontesisto.it/) has fond memories for me and is often a place I find myself drifting back to. The staff have not changed in YEARS and given that the hotel is a short walk from either Trastevere on the other side of the river or the Campo dei Fiori, the Piazza Navona, and everything else you will want to see makes this a fantastic place to start and stop from! 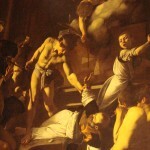 If, however, you are a fan of Roman history and architecture, you must stay at the Hotel Donna Camilla Savelli hotel (http://www.hoteldonnacamillasavelli.com/) at least once. A former convent (or monastery depending on what you read) designed by the renowned Borromini, the architectural influences are stunning and some of the remaining religious touches are breathtaking (there’s a small set of steps with an alter by Borromini that is breathtaking). Located in my favourite neighborhood of Trastevere, the hotel is relatively quiet but still close enough to everything that you could want to do. 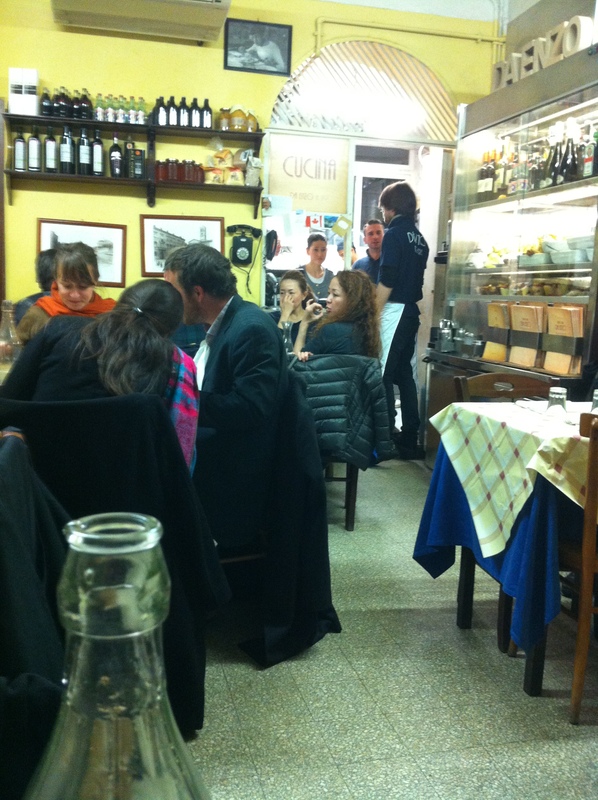 My favourite restaurant and it’s been in Rome for ages, what some would call an institution! Da Enzo (http://www.daenzoal29.com/ reservations imperative) is sheer perfection and unpretentious. Indoors, there are less than 40 seats, all situated quite closely but don’t let that put you off; the food is outstanding, the service efficient but not rushed nor achingly slow, and wine selection not too shabby. 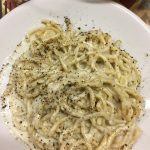 One of my favourite pasta dishses is cacio e pepe and this was, by far, the best cacio e pepe I have ever had. I want to go back right now! 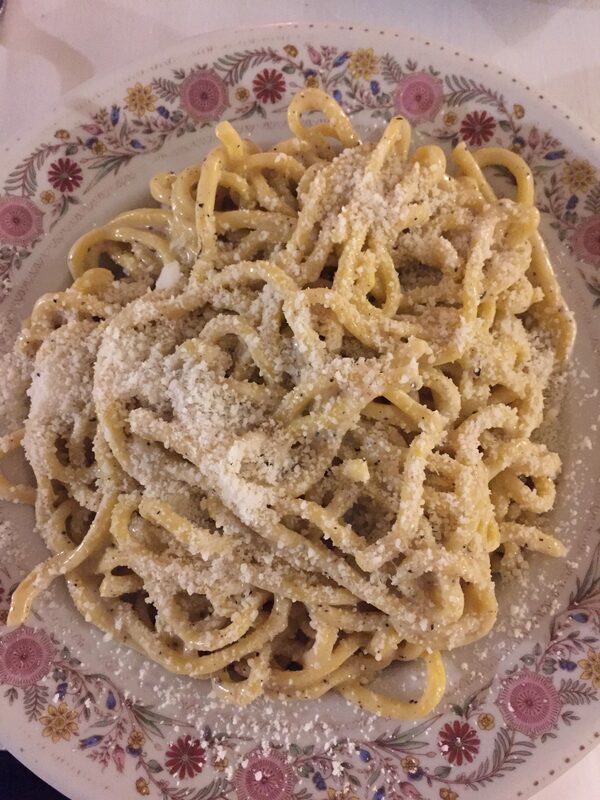 A close second to my new favourite restaurant is Flavio al Velavevodetto (http://www.ristorantevelavevodetto.it/ reservations suggested) a 30 minute walk to Testaccio if you are staying in the center of Rome. And I promise, it is worth the trek: the restaurant appears to be underground and the dining rooms look as though they are located in former wine vaults that have been painted white. The service was immaculate and the food simply outstanding. 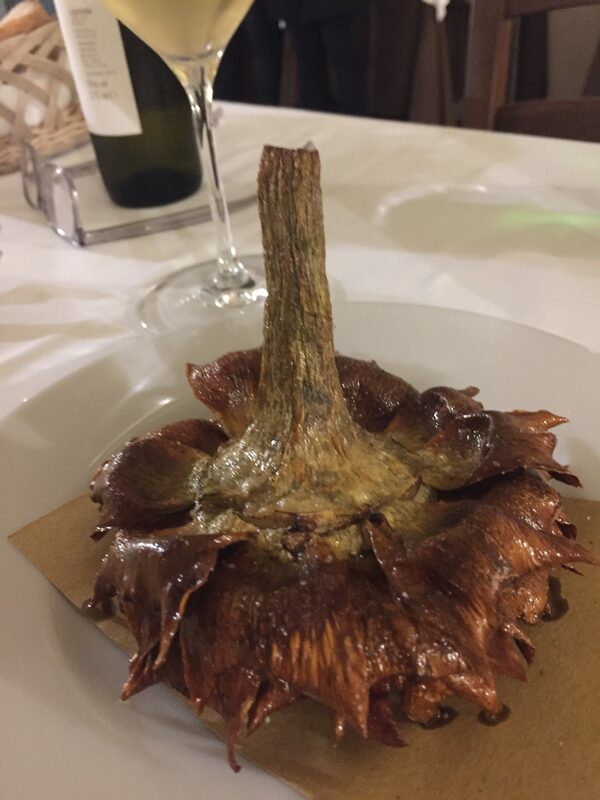 On the night I dined, I had a duo of carciofi – artichokes – one fried (carciofo alla giudia) and the other cooked in lemon and oil (carciofo alla romana) and they were outstanding. The pasta was an amazing ricotta filled ravioli with salt and oregano and although I’m not normally a fan of oregano, this was delicious! 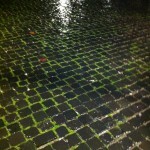 Closer to the Hotel Ponte Sisto is La Carbonara located in the Campo dei Fiori. This is a bit on the touristy side but the antipasto options are outstanding and in a pinch, it will do. 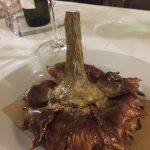 I am ashamed to admit that I forgot one of my friends favourite restaurants: Ristorante – Pizzeria “La Fraschetta” (www.lafrascetta.com) in Trastevere. The carcioffi are, literally, to die for and if you want a real taste of garlic, this is the place for you! And don’t go for the house wine but, instead, ask for a bottle of wine that fits your needs; their selection of wines is outstanding and it won’t break your bank! 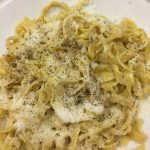 Another small place that always puts a smile on my face is Trattoria de Gli Amici, also in Trastevere in Piazza Sant’Egidio. I have never been here for dinner but as a place to stop for lunch, especially on a sunny day looking at the piazza and everyone walking around, it is close to sheer perfection. 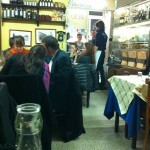 And why this restaurant as opposed to others in Trastevere? Because they employ people with special needs and the money goes toward the ongoing support of the Roman special needs community. And right next to Piccola Roma is Giolitti (http://www.giolitti.it/), what I consider to be the best gelato place in Rome. Another restaurant that I must mention, and am embarrassed that I have forgotten all these years, is Dar Poeta (http://www.darpoeta.com/), one of the best pizzerias in Rome, located just across the river in Trastevere. If memory serves, and as the lines out the door will attest, Dar Poeta doesn’t take reservations but I assure you, it is worth the wait. 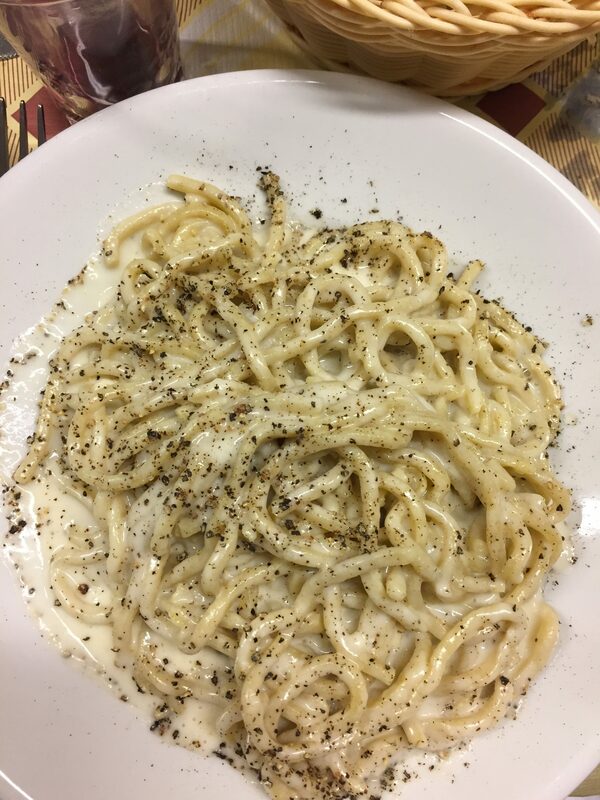 And if you seek an affordable, yet traditional Roman meal, you must seek out Trattoria da Lucia (http://www.trattoriadalucia.com/ reservations suggested). Even smaller than Da Enzo, the atmosphere is typically Roman as is the food. On the night was I was there, a table asked what was good and the waiter listed the classics like pasta arrabiata and tripa alla romana. The staff aren’t known for the congenial demeanor, but the food and wine are worth the trek and when the restaurant is filled with non-tourists, you know you are at a good standard place. My latest finds (as of this update in June 2018) is Sora Margherita (https://www.soramargherita.com/). Located near the Jewish Quarter and although very small, and somewhat rustic, is an absolute must! 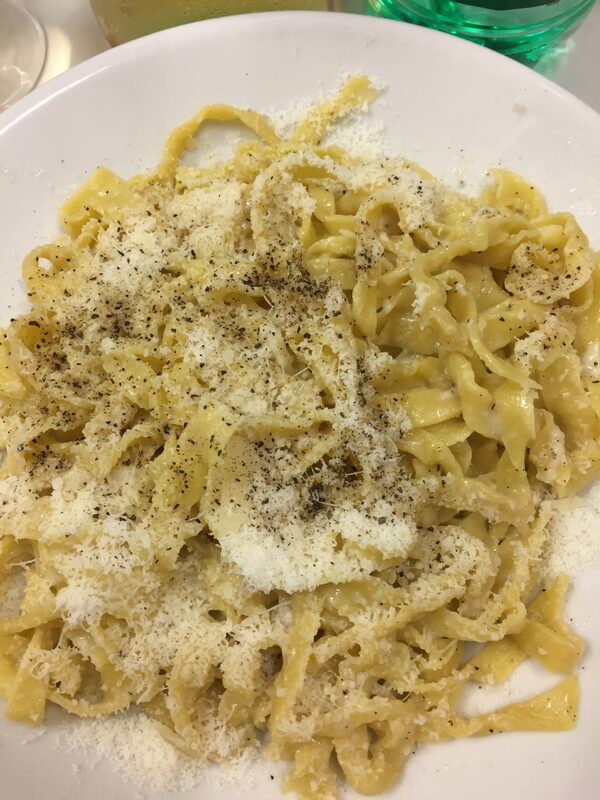 I am embarrassed to say that it has taken me this long to find this outstanding restaurant with probably the best fettuccini, with cacio e pepe, that I have ever had! If I only had two nights in Rome, this would be one of the restaurants that I would have to return to. You will see the Coliseum, the Piazza Navona, the Palatine hills, and do many other picturesque things that I won’t repeat what your guide book tells you. Instead, I will tell you my 3 favourite things that you must see on any trip to Rome. 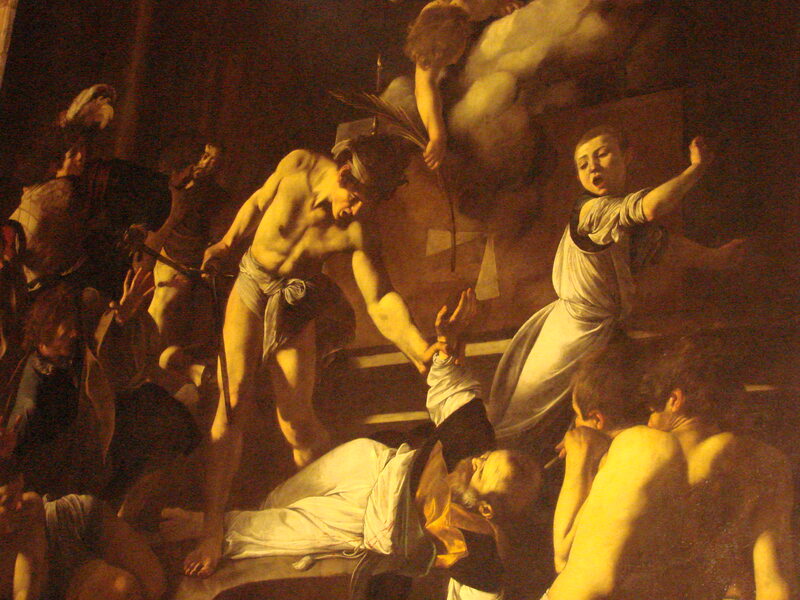 First, you must go to San Luigi dei Francesci; here are 3 original Caravaggios painted on the walls of the church so they can never be removed. This is how art was meant to be viewed and the solitude of the church, even though teeming with tourists, is sheer tranquility for me. Secondly, if it is open or you can convince someone to let you know, go to the Santa Maria dell’Orazione e Morte (on the via Giulia near the Hotel Ponte Sisto) which is the oddest and most bizarre church in Rome: it is full of bones and skull that have been made in to crosses, light fixtures, etc. And this is no stunt or shock-value church. It is the real thing. Thirdly, you must cross the river and go to Trastevere and wander and get lost and have a coffee and stop for lunch at an outdoor café. 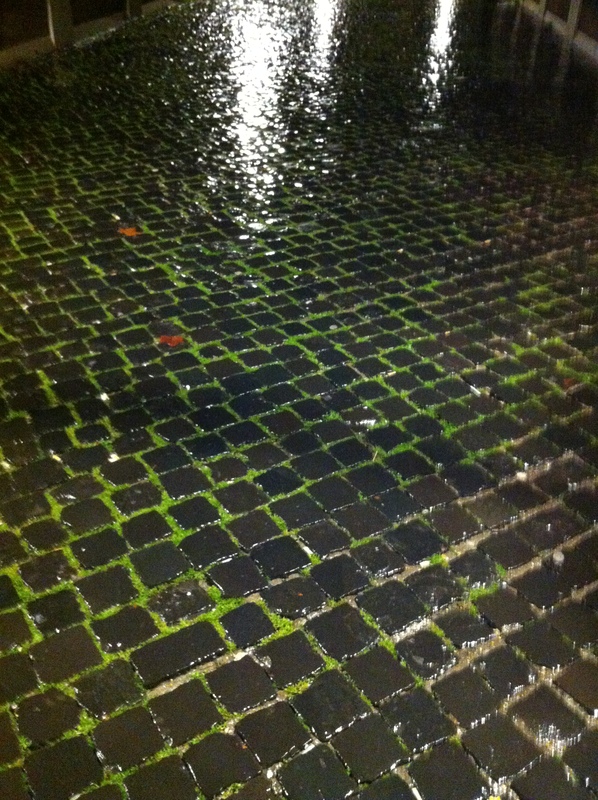 And if you find yourself near the Colosseum (really?! ), San Pietro in Vincoli is one of my favourite churches, due in many parts because it is hard to find, and thus the church is not overrun with tourists, but most importantly, because of the sculpture of Moses by Michaelangelo that is one of his greatest works. And a bit of Trivia: the story goes that Michaelangelo was so consumed by this massive sculpture that when it was finished, he was certain that it was real and would come to life and thus threw his hammer at the knee of Moses to make it rise. (It didn’t.) And the horns on this head: they were meant to be rays of light but due to a translation issue (sic!) of “keren” for horns was used instead of the intended “karan” for rays. This entry was posted in Rome and tagged architecture, colosseo, colosseum, de'ricci, Flavio al Velavevodetto, food, foro italia, italy, peace, people, Roma, Roman Forum, rome, Trastevere. Bookmark the permalink.